We've all seen articles on how fashion translates to interiors, but I personally have yet to come across a feature on how interiors connect with beauty products. I'm super excited about this because not only am I a design junkie, but I love, love, love beauty products (high or low) as well. 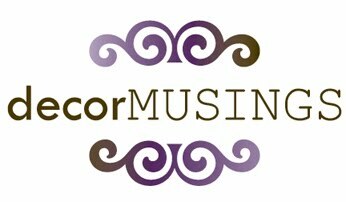 There's no better way to cover these two passions of mine than with a new weekly feature here on Decor Musings called "Beauty Meets Decor." This brings me to my favorite color -- tangerine. 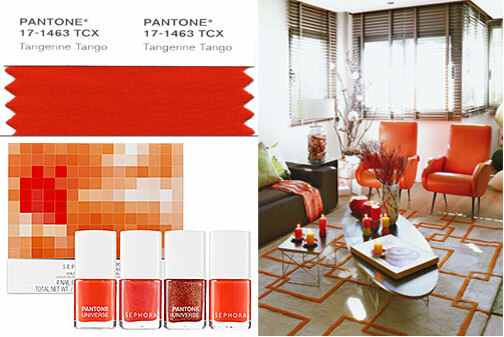 Pantone named Tangerine Tango the color of the year, and for very good reasons. The hue is a pretty marriage of red and orange that I especially love to see in nail polish. Essie's Fifth Avenue is my favorite, but Sephora also released a fab collection of polish and other products dedicated to Pantone's color choice. 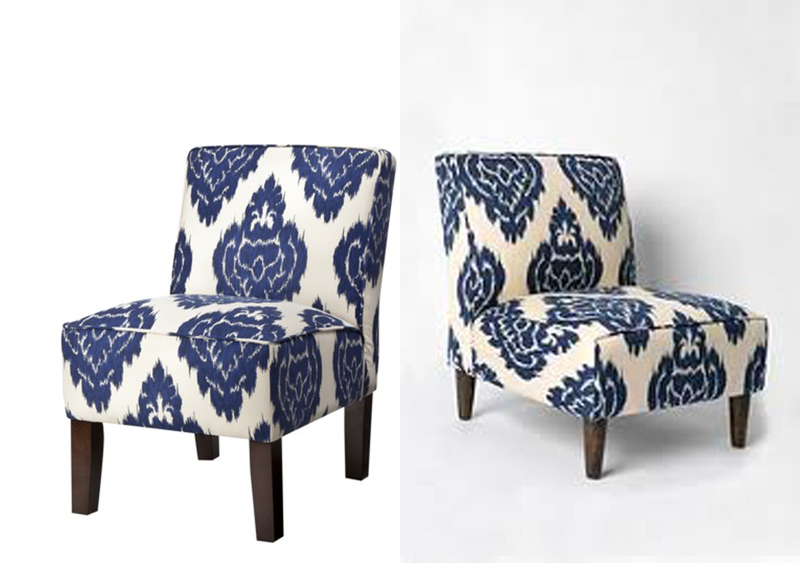 Not only does the color take it to the next level in beauty, but it also works well in the home. Like the home featured here, I like to see tangerine with chocolate brown and beige, but it also works well when combined with navy, gray, turquoise, fuschia or even deep purple. It can be reserved just for accessories like a rug, a throw placed over a sofa or pillows. 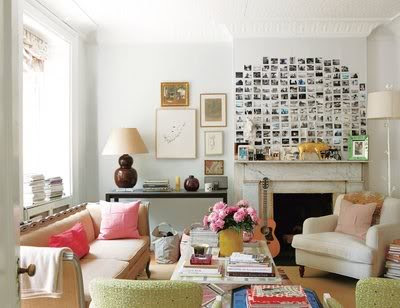 But if you're more adventurous, it could look great as an accent wall or a sofa. To me, it is a fashion-forward kind of color. Would you tango with tangerine? P.S. for NYC residents, there's a Sephora and Pantone Universe Pop-Up Color Shop in the Meatpacking District, Chelsea Plaza, at 14th Street and 9th Ave. It's open through March 30. The hours are Tuesday & Wednesday from 10am - 10pm and Thursday and Friday from 10am - 9pm. I invited Patricia Hall from London-based Serenata Flowers to share her pointers on creating stunning floral arrangements. Enjoy. While flowers will always reflect an eternal sense of beauty, there is a component of current style and fashion to keep in mind. 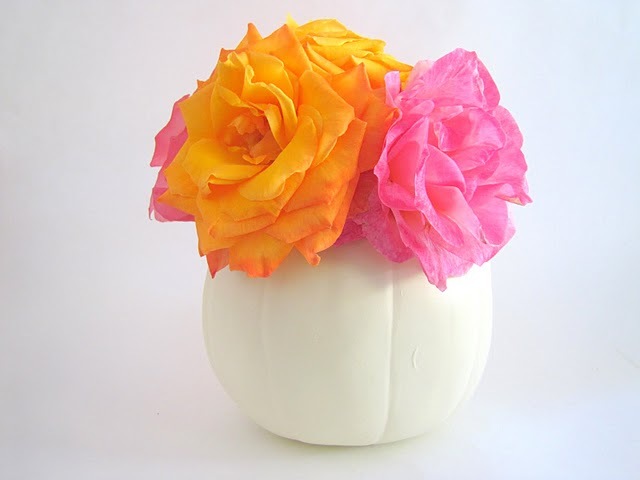 Here are some tips to consider to help make flowers really work for you. Flowers are so beautiful, it can be tempting to cover everything in them! But it's worth standing back from time to time to make sure the pieces that have been chosen are there for a reason. When too many flowers are in one place, sometimes the centerpiece becomes too busy and the viewer's eye is unable to find a place to rest. Without some focal point, a creation like this can be missed or even dismissed by those who see it. At the same time, it is better not to be too minimalist in your decorations. While that look can be graceful and classy, it is also somewhat familiar and uninteresting at this point. Adding a touch of excitement to your arrangements with a striking color or an area of abundance can really liven things up. For instance, you might have a group of small violets or roses in different colors at the bottom of the arrangement, with a large white orchid or lily above them. When you choose the flowers for your arrangement, consider the way they fit with one another instead of just choosing the ones you like best. Having some kind of theme is important to design. In the end, the arrangement should be made with intention. When you order flowers, it is because they will fulfill a purpose, and fit into the world that is being designed. The color and size of the blossom may be already assumed as important, but the shape of the petals, the extension of the leaves and stem, and the potential for singular versus grouped use have to be taken into account as well. The texture and "mood" of a flower will have as much impact on the environment created as the color, and limiting the variety of different forms can really streamline your creation. Paying attention to color, texture and size, in blossom and body of the flower, and deciding on a few key attributes to accentuate, can bring together an elegant presentation. After attending a preview of Target's spring/summer home line a few months ago, I left the event feeling like I had completed a lesson in home styling. The line is full of great colors and all the right patterns, and the way the pieces were arranged helped me visualize how they might be used in my own space. I loved it. Check out the pics I snapped at the event. I'm especially crazy about the chevron lamp shade (only $20!). A new lifestyle magazine out of Germany called sisterMAG invited me to do a fun roundup of my favorite products in white. It turned out cute, right? Be sure to check out the digital magazine, too. Thanks for the opportunity, sisterMAG! 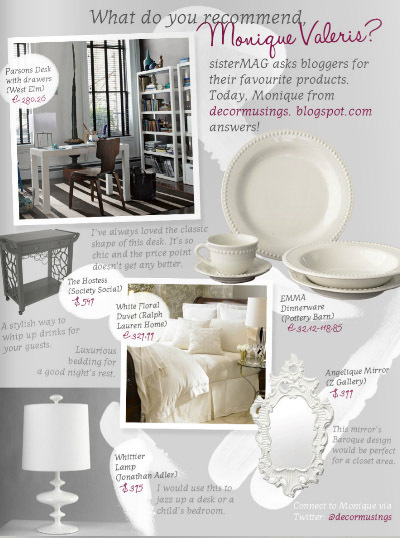 Check out my blog post on Shecky's for decorating tips that won't send your guy running for the door. Think unisex colors, light fragrances, accent tables and more.